PHOENIX — Biologists with the Mexican Wolf Interagency Field Team (IFT) recently learned a fostered wolf pup introduced to a pack in 2014 has produced a wild offspring of her own. A Mexican wolf walks through the snow. A recent genetic test of a male wolf revealed that it is the offspring of a previous wolf pup placed into a foster pack in 2014. 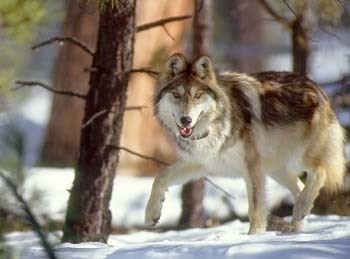 In a critical breakthrough in Mexican wolf management, the U.S. Fish and Wildlife Service recently reported that a genetic test of male 1561 revealed that it is the offspring of male 1293 and female 1346. The female was one of two pups fostered into the den of the Dark Canyon Pack in New Mexico in 2014. The Arizona Game and Fish Commission and department support this fostering technique that introduces very young pups from captivity and places them into a wild-born litter of the same age. The pups are then raised in the wild rather than captivity. Critics of the commission’s decision to restrict releases in Arizona solely to fostering pups argued that until these pups reproduce there would be no genetic rescue. “One of the key challenges to recovery of the Mexican wolf is long-term genetic management given that all Mexican wolves alive today originated from a founder population of only seven animals,” deVos said. “This approach has been used in genetic management of other species but until this month was unproven for Mexican wolves,” said deVos. The Mexican Wolf Reintroduction Project is a collaborative effort of the U.S. Fish and Wildlife Service, Arizona Game and Fish Department, White Mountain Apache Tribe, USDA Forest Service, USDA Animal and Plant Health Inspection Service – Wildlife Services, and several participating counties in Arizona.